As well as being a pretty & impressive gift, these jam thumbprint cookies make for a beautiful 'Alice in Wonderland' style addition to afternoon tea and will be loved by all ages. When I’m putting together a post I usually look at what I’ve made and then choose something from my little cupboard of crockery that co-ordinates with it, colour-wise. This time, however, I went about the process differently. I thought about the vehicle first (a new cup, bought last weekend, in my favourite shade of pink) and then worked out what I wanted to make from there – a colourful biscuit to cheer me up in what must surely be the longest, greyest, mistiest March ever. 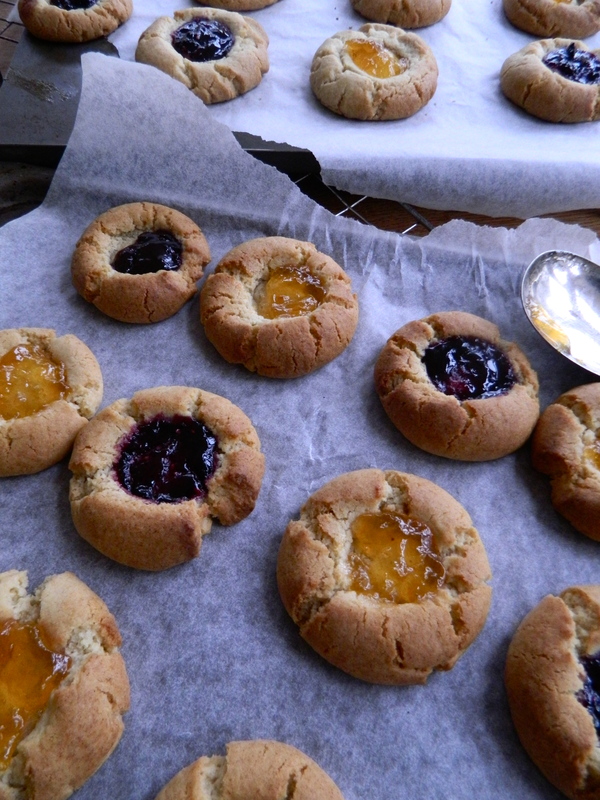 I eventually decided on a jam thumbprint cookie, which I made with an almond base, alternating between an apricot and mixed berry jam topping on each. I’ve been meaning to try these for quite a while as they look so appealing in pictures – like stained glass – but I couldn’t find a recipe that suited: some had cream cheese, some had coconut. So I used a basic sugar cookie dough and added ground almonds and almond essence. This almond version makes a lovely biscuit: crisp, short and buttery. Preheat your oven to 180°c. Sieve the flour and the baking soda into a bowl and add the ground almonds, mix. In a freestanding mixer, combine the butter, sugar, egg, almond essence. Turn down the speed and add the flour slowly, scraping down the sides of the bowl all the while. Bring the dough together by hand. This makes quite a stiff mixture, but if it doesn’t come together by hand, add a tiny bit more butter and mix again. Then shape into a ball and pull off 1inchx1inch pieces of dough. Roll these into balls and place on a parchment-lined baking tray. With a damp finger, press down hard on each ball. Bake for a little under 10 minutes, or until faintly golden and just setting. Remove from the oven, reform the hole with a wine-cork or anything that will make a small deepish circle. Spoon about half a teaspoon of jam into the holes and re-bake for another 10-15 mins. Cool on a wire rack and store in an airtight container.